Not only does Rushton Hall offer some of the finest meeting rooms in Northamptonshire for your business and corporate requirements, we also offer a fantastic range of Christmas party options to round off the year in style with your colleagues! This Christmas, experience a night of fine dining and entertainment at one of the most exclusive party venues Northamptonshire has to offer. Choose one of our select party packages (which you can view in our brochure) and enjoy a fun and festive end to the calendar year with one of our brilliant Christmas Party Nights. 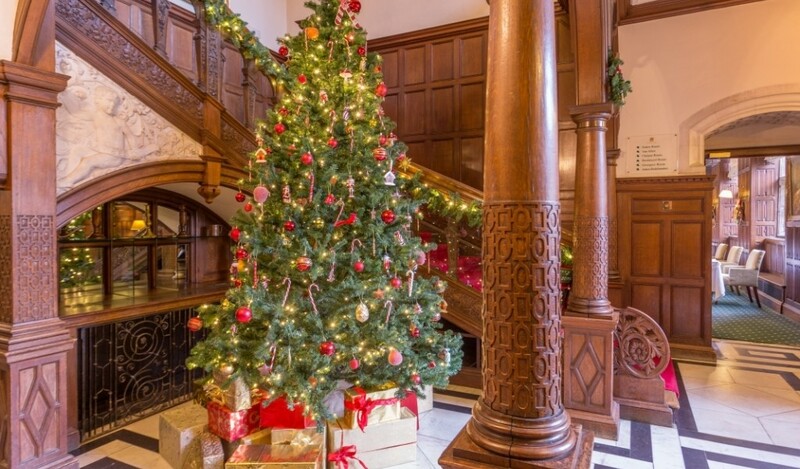 Our Christmas Party Nights are held in the Pavilion from 7.00pm until 12.30am, and will begin with a glass of sparkling wine served in the Great Hall before heading to the Pavilion for dinner and festivities with a live swing singer and DJ. For those who fancy a more intimate Christmas party, then our stunning Cellar Bar and Dining Rooms are available for private functions. These offer the perfect environment for a more exclusive party, with buffet prices starting from £30 per head and dinner prices from £55. Rushton Hall is the perfect lavish setting to party the night away with your friends and colleagues and with such delectable menus and exciting entertainment, who could say no? For more details on Christmas events at our enchanting party venue in Northamptonshire, or to book, please contact our events team on 01536 713 001 or email enquiries@rushtonhall.com.